The next game from our StarSeries i-League 2019 Betting Predictions list is FaZe Clan vs Renegades. This matchup will surely be the most interesting match on tomorrows schedule. FaZe Clan is currently the best team in The StarSeries after two rounds. Their first match was against paiN Gaming in which they won 2-0 on Inferno and Mirage. They also won 2-0 against ViCi Gaming on Dust II and Overpass ( in which they dominated 16-3 ). That means that they didn’t lose a single round so far. This shows how good and confident they are. Renegades is currently third in the bracket. So far, they played against TYLOO and won 2-0 on Inferno and Dust II. The second match was against MIBR, which was played on Train, Cache, and Mirage. It ended 2-1 for Renegades. They won on Train and Mirage. They had tougher opponents but they are also undefeated so far. This match is really hard to predict. But, I would say that FaZe Clan has a little bit of an edge over Renegades, mostly because of an amazing start in the tournament. I also think that they looked more confident in some matches. Also, FaZe Clan had better results this year than Renegades. Interestingly, so far, Faze Clans and Renegades head to head history is 3-3. This shows how close this matchup might be! This is a best of 3 match and it would probably go in the third map. FaZe has a great map pool, but Renegades also doesn’t drop their picks. Each team would most probably win their own map of chose. 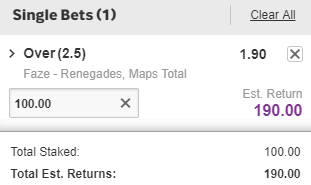 With that being said, the best betting prediction for a match between FaZe and Renegades is to bet on a number of maps. Good luck! & Stay tuned for more StarSeries i-League Season 7 betting predictions and tips.